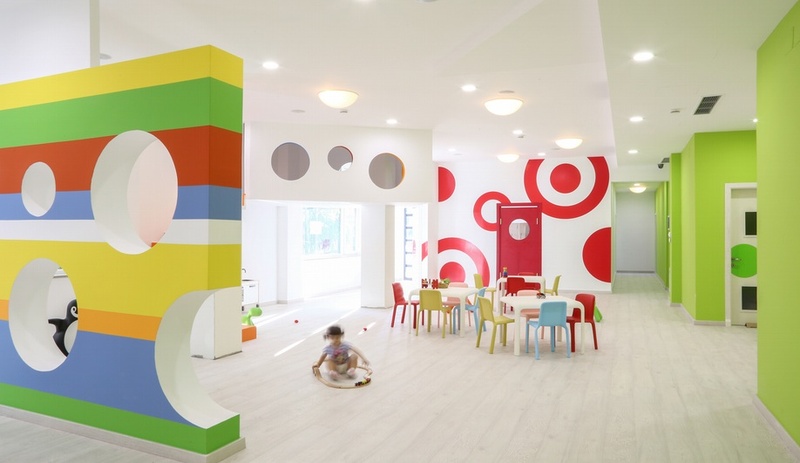 Iaboni + Priftaj Design Associates packed the BimBamBum kindergarten with shapes and colours to stimulate the imaginations of children under six. Bright colours everywhere. 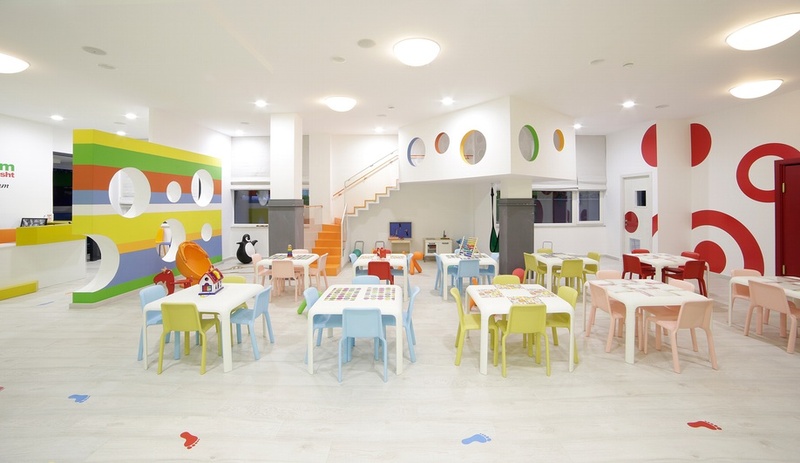 IPDAA have just completed a 600-square-metre interior bursting with vibrant hues and animated by various shapes for the on-site daycare of 2FAF, an aluminum and glass accessories manufacturer headquartered in Tirana, Albania. The kindergarten is divided into five classrooms of roughly equal size, each designated for a different age group. 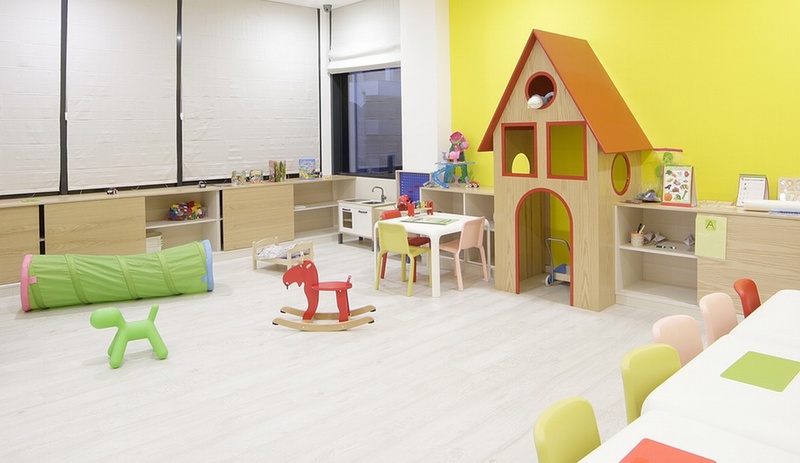 In each, the installed furniture, including storage modeled on peak-roofed houses, brings the scale down to kid-size, while five distinctive colours of eco-friendly paint help to distinguish one classroom from another. 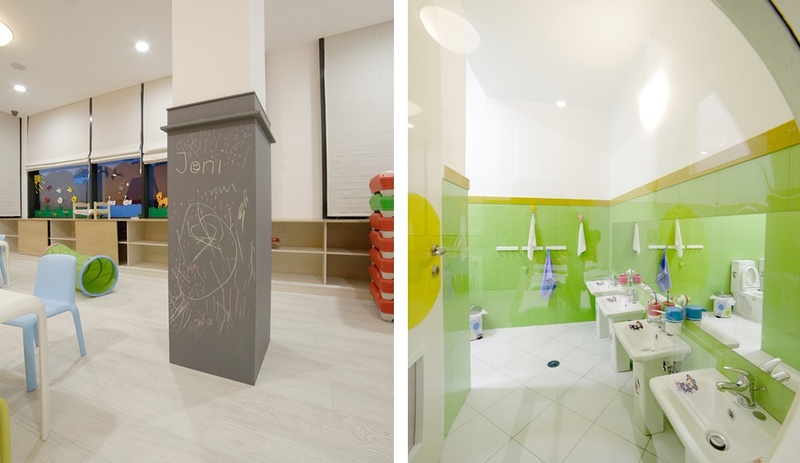 The rooms also have their own child-friendly washrooms to allow teachers to keep an eye on all their students from inside the classroom. 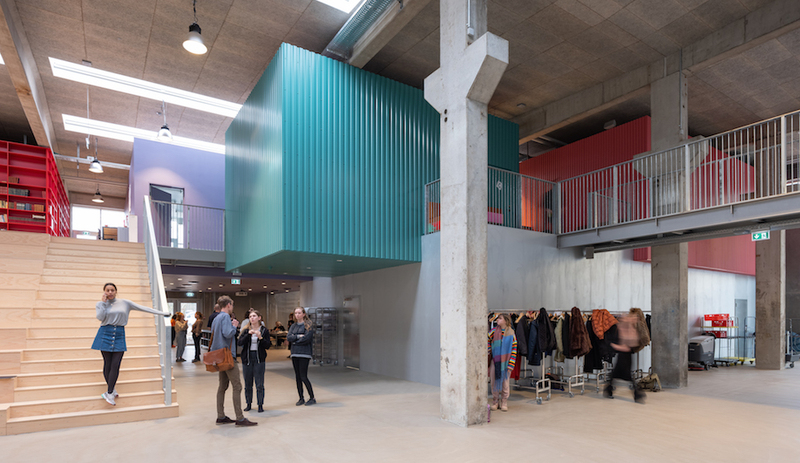 The classrooms cluster around a large common area, where the colours that distinguish one space from another come together and combine to kaleidoscopic effect – especially on a striped feature wall, perforated like Swiss cheese with porthole-like openings, that separates the common area from the entrance and reception. 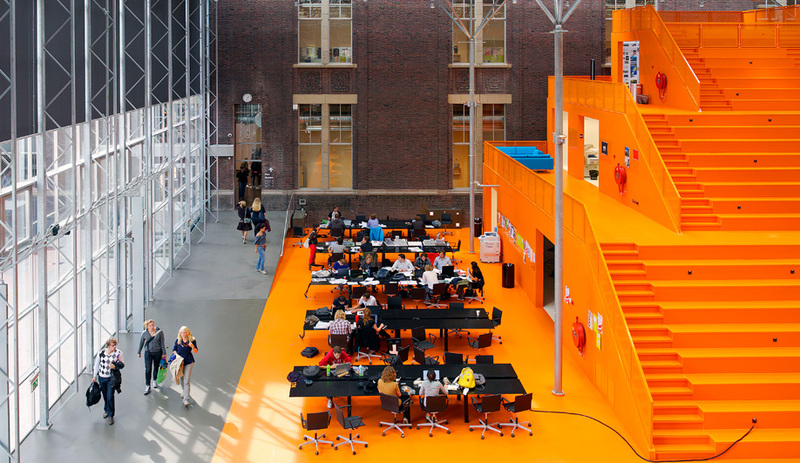 Each of the featured colours found in the entrance leads through the common zone to a different section of the building, sometimes in the form of a painted wall or handrail, at other times as footprints stencilled onto the high-resistance wood flooring – a whimsical way-finding technique that’s capped off with a large matching dot encircling each classroom’s door handle. 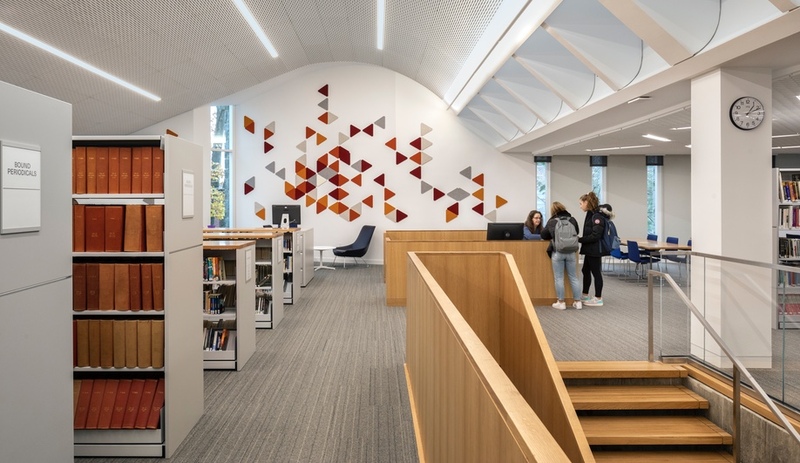 The double-height common room also includes a kid-friendly “treehouse” that overlooks the activity space below, integrated directly into the building’s walls from its perch on a load-bearing pillar. 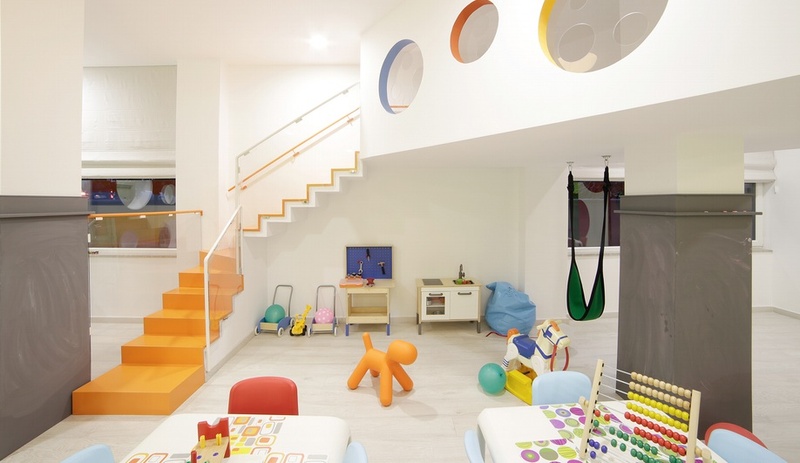 It’s one more example of IPDAA’s playful use of scale, with its child-friendly round cutouts to echo the circle motif found scattered throughout the interior. The toys and furniture reinforce a sense of fun, too, at a scale that’s geared towards kids: between the pastel-hued tables and chairs, you’ll find Magis Me Too’s animal-shaped Puppy and Pingy, and Ikea’s retractable-hood PS Lömsk swivel chair.